Cha’Asia “Red” Rucker (arrived to Eagle Rock in September of 2014) – Red comes from Bridgeport, Conn., and is a member of Aspen House. As the veteran student at Eagle Rock, Red has worked to create a culture focused on building relationships with whoever is at the school regardless of tenure. During her stay here, she has co-started a student organization known as Power to the People, which intends to bring awareness on important current topics that affect the country. Red plans to move to San Antonio, Texas, to attend community college, followed by a four-year institution to pursue a degree in biology and then obtain her doctorates degree in something related to. passion and interest in learning more about the anatomy of the human body. She admits part of her decision to move to San Antonio is her passion for the San Antonio Spurs. She hopes to be able to attend as many games as possible while she studies and works. Brianna Campbell (arrived at Eagle Rock in January of 2015) – Brianna hails from Harlem, N.Y., and is a strong member of Spruce House. During her tenure at Eagle Rock, she has gained the respect of her fellow peers and staff alike. As a student, she has been a member of Mag 7 (an organization led by the seven Eagle Rock School students with the longest tenure at the school), a kitchen patrol leader, and a greeter for the Professional Development Center, responsible for visitor orientations. She has also built strong connections with the staff in the hope of returning and keeping in touch with the Eagle Rock community. Her plan is to return to New York and attend community college to save some money for potential trips around the world. Brianna hopes to gain a degree in Translation & Interpreting and use that degree to work in other countries, with her top choice being Japan. As she travels and creates new connections, she wants to earn a Ph.D. in psychology and learn other languages, including Spanish and American Sign Language, in order to help communities around the world. Jefer Gomes (arrived at Eagle Rock in June of 2015) – Jefer’s hometown is Queen Creek, Ariz., and he is a proud member of Pinon House. Outside of his passion for music and video production, Jefer has also taken the lead on a variety of roles at Eagle Rock. Some of those roles include mentoring new students arriving fresh on campus each trimester. He has also been a kitchen patrol leader, and a house leader responsible for ensuring the well-being of students living in Pinon House. Jefer’s post-graduation goals begin with obtaining a good job so he can pay for the things he needs and wants. He also wants to save up to attend community college in Arizona and then hopefully go to California to attend a four-year institution. There, he wants to study either graphic design or chemistry, even though his biggest passion is video editing. Carolina Avalos (arrived at Eagle Rock in January of 2016) – Carolina is originally from Oakland, Calif., and is a member of Aspen House. She has become a strong leader within her house and stayed involved during her time at the school. Like other graduates, Carolina was involved with Mag 7, the previously cited leadership group made up of strong student frontrunners within the community. Carolina was also a strong advocate for the environment. In particular, she signed up for RecreArte, a class dedicated to learning new environmentally friendly ways to produce art and recycle materials that are normally tossed out in the trash. Her first order of business after graduating Friday is to head home and become employed in the Emergency department of an animal hospital. She also plans to get her driver’s license, so she can drive to her vet technician school as she works towards receiving a degree in that field. Carolina also plans to continue working with local organizations that support the environment, education, youth, and women. Congratulations again to all four of our graduates. 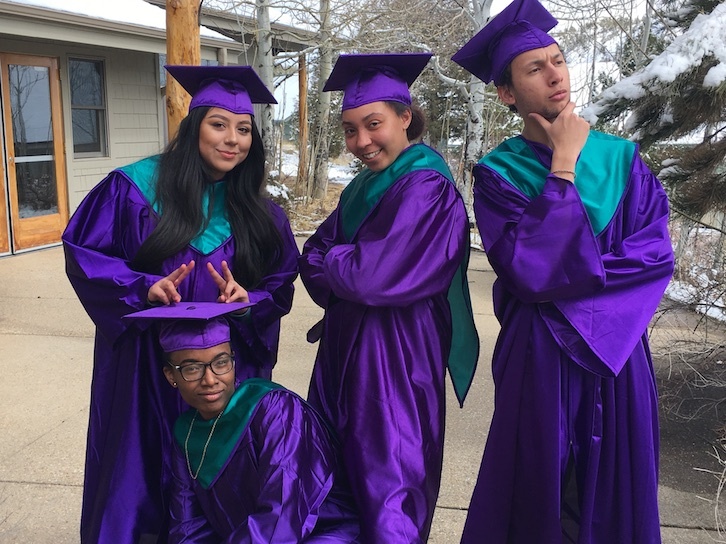 Again, the graduation ceremony begins at 4 p.m. this Friday — April 13 — and can be viewed live online by visiting the Eagle Rock School and Professional Development Center Facebook Page. 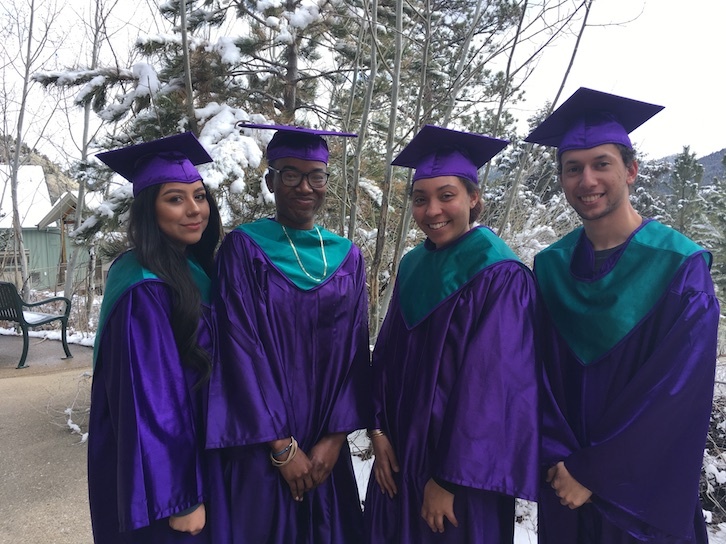 This entry was posted in Meet The Student and tagged Aspen House, Brianna Campbell, Carolina Avalos, Cha’Asia Rucker, Graduation, Jefer Gomes, Mikal, Piñon House, Spruce House.